Cheryl joined Cirque de Flambé in February 2001. She is the inspiration behind the Cirque character "Fire Monkey." She has a background in martial arts and has been a performer since she was 8 years old. 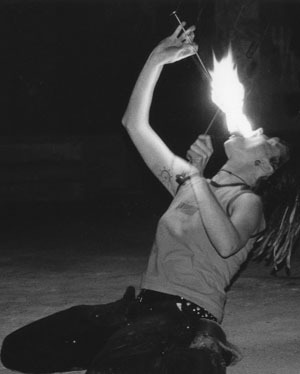 In 1995, while in Hawaii, Cheryl saw traditional fire performing for the first time and months later back in Seattle, began to spot fire eaters at the music shows she attended. She hasn't been the same since. It wasn't until July of 2000 that she began performing with fire herself. Cheryls main strengths are in fire chains, single/double staff and nunchuks. She is also experienced with many other fire tools as well as stilt walking and juggling. Her goals for the near future are to incorporate acrobatics into her performance.